Today Iranian military forces tested various unmanned aircraft that some are calling "suicide drones." Because "suicide drone" sounded more intimidating than "model airplane that we could fly into things nearby." Iran has been conducting military exercises for the past week at the Strait of Hormuz near the Persian Gulf. The show of force has involved air, land, and sea maneuvers over 850,000 square miles. According to the Associated Press it's unclear which of Iran's unmanned aircraft are supposed to be the "suicide drone," but Iranian news sites have run a number of images that show drones which quite frankly might fit under a Christmas tree. 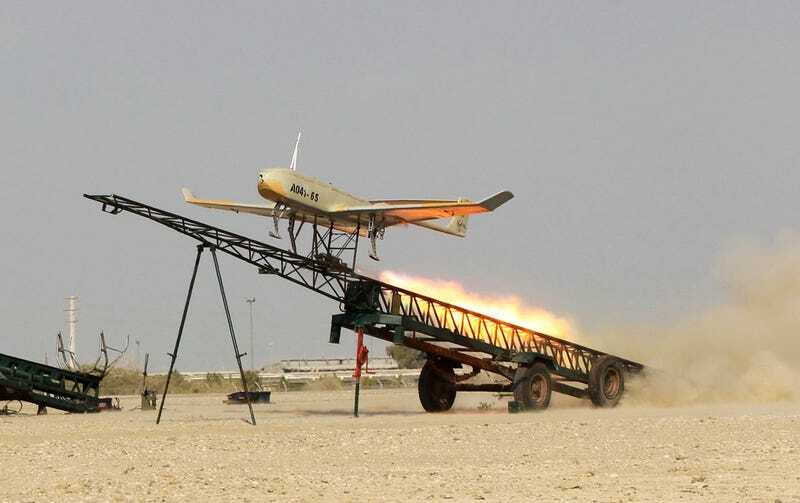 Some media outlets have referred to the "suicide drone" as the Yasir drone, known to be a modified version of the American ScanEagle drone, captured by Iran in 2012. Other Iranian media have referred to the Raad-85. That Iranian-made drone is specifically designed to crash into an enemy and explode its warhead. This week's exercises are codenamed Mohammad Rasoulallah, meaning Mohammad the Messenger of God. Much like the U.S. military, Iran has also been using drones for target practice during this week's drills. Three drones have reportedly been shot down over the past week. Iran's drone capabilities to date have been highly suspect, with many speculating that some of their more advanced looking UAVs can't fly. However, Iran does seem to have unmanned surveillance aircraft capable of 10-hour flights. Unconfirmed reports have said that Iran's Shahed-129 drone can stay in the air as long as 24 hours and has a range of just over 1,000 miles.